Step Two: Compile list. Be sarcastic. Be witty. Use a few swear words, so we know you’re cool. Link to other things you’ve written. Reference pop culture AND invoke some nostalgia. Make ’em laugh, but be sure to hit ’em in the feels. Step Three: Make it sparkle. Add images. Add GIFs. Play with bold and italics and acronyms. Lolz, this is so fun. Step Four: Get social. Tweet, Tumblr, Facebook, Pinterest the heck out of that thing. Step Five: Sit back and watch the internet explode. Here, I will show you an example. I will even time myself, to see how long it takes to produce such quality content. First, I shall brainstorm my list of ideas. Nouns: Kindergarten, Puppies, Elephants, Pinecones, Traffic Lights, Tooth Fairy, Trailer Parks. This kid is doing it right. Aim for this. 1. How to use a toilet. You do NOT want to mess this up, bro. There are no diapers post super-liberal preschools. You are almost five. Time to potty. You see that cool bathroom pass hanging up on the wall? Do you think kids in diapers get to use that? Because they DONT. Cups of coffee consumed: 2. Times I gagged watching booger video: 4. See?! It’s too easy! Let’s all kill quality writing together. To be honest, though….I kinda want to write an article about things to never say to a pinecone. I saw something on twitter the other day…the guy was saying that he’s pretty sure we’ve tweeted all that there is to tweet, so maybe it’s time we start shutting this twitter thing down. I don’t know if you’re on twitter, but I kinda agree, and in terms of what’s out there to read these days in the twitterverse and beyond, I’d have to agree more. I’m getting tired of seeing lists of things. I think we have made all the lists there are to list. But sometimes I get scared that if I write something long and, God forbid, meaningful, people won’t have the attention span to read the whole thing. And I measure my self-esteem by how many blog hits I get, which I rationalize is a better number to judge my value in than the number on the scale. So I put things in bullet-point form, like it’s somehow shorter. It’s a visual trick, really. The word count remains the same. Why all the lists? Do we not trust readers to pay attention long enough? Do we not trust ourselves as writers to effectively capture their attention? Do people need to know how many points – 3, 5, 7, 9 – they have to read to get through an article, before they commit to clicking on it? It’s like in college, when you would buy a used textbook, and the person had already high-lighted things…you would have to ask yourself if you would still read what was not highlighted for you. It might come back to the basics: Why are we writing what we’re writing? And who do we want to read it? And what do we want them to feel? Do I want my stuff to go viral? Well…only if it magically led to a book deal and a movie deal and I got to cast all my celebrity crushes and control the making of the soundtrack by appointing all my favorite bands, alive or dead. That would be worth it. BUT, whenever stuff I write for HuffPo gets a lot of attention, I get a lot of angry people telling me I’m stupid and I have to live in sweatpants for a week to get over it, so….I don’t know. Haters gon hate. 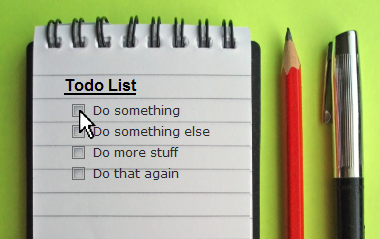 I’d love to hear anyone’s ideas about this list phenomenon…have we gone too far with the lists? Are there any lists left? 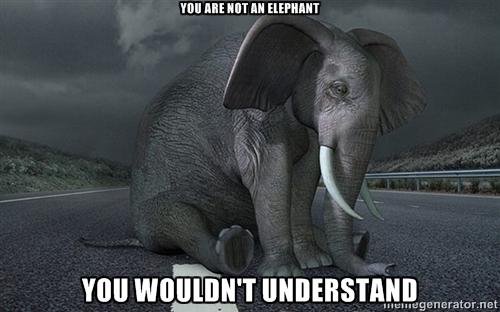 And what do only elephants understand? !